The Motorola Moto G 4G comes with a 4.5" 720p display, which is one of its most potent weapons in the fight for survival in the overcrowded midrange. Having a pixel density of 326ppi, the IPS LCD matches a the retina-grade screens by Apple and is by far the sharpest display in the price range. 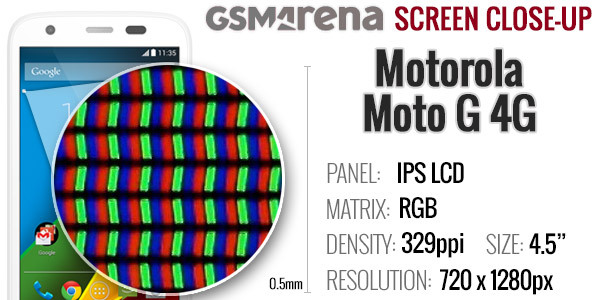 It's not just the pixel count either - the Moto G 4G screen is really bright, even brighter than Moto G's, and impresses with very good contrast and nice color rendering. Viewing angles are also quite good, with everything remaining legible even when you go to extremes. There is some color shift, but even so the display is way better than we've come to expect in this price bracket. Our only gripe is the white balance, which is a bit on the cold side, but that's nitpicking really. The screen glass isn't too reflective either, which means the Motorola Moto G 4G's display does pretty well in direct sunlight. An admirable overall performance indeed. 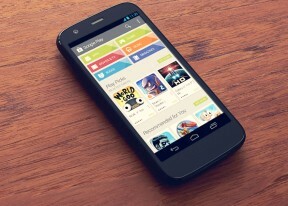 The Moto G 4G features a 2,070 mAh battery, but Motorola didn't quite any specific times. The original Moto G scored an endurance rating of 54 hours, which was an OK result and we expected similar performance - perhaps even a slight drop, considering the added LTE radio. As it turned out, the latest Android build and its optimizations helped the Moto G 4G do better than the Moto G. The score of 64 hours means the Moto G 4G will last for well over two full days if you do an hour each of calling, video watching and web browsing a day. Note that the Moto G is already running on the same software version and its battery performance may've improved as well. We also should give the Motorola Moto G 4G a few extra points here as it's notably brighter than most of its competitors at the 50% setting, which we use for our battery test. 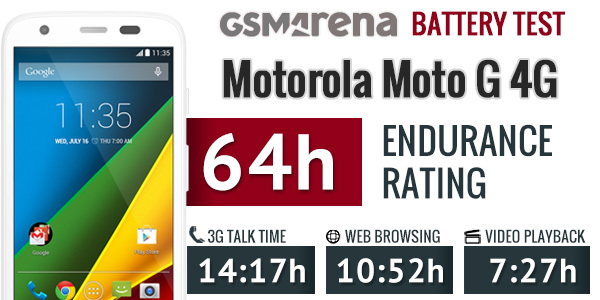 For a more detailed breakdown of the Motorola Moto G 4G battery performance check out our blogpost. The rest of the connectivity features available across all models include single-band Wi-Fi b/g/n and Wi-Fi hotspot. There is also support for Bluetooth 4.0, GPS and GLONASS. There's an FM radio with RDS as well. There is a microUSB 2.0 port for charging and data connections. Media transfer mode is supported for accessing the phone's built-in memory and microSD card over a USB connection. The Moto G 4G also supports USB Host. The microUSB port doesn't have any TV-out support, but if own a compatible HDTV, you can share your phone's screen wirelessly via the Miracast protocol.